- An amazing weather pattern came strolling through the northeast over the weekend so I took advantage of the abundant sunshine and warm temperatures to get in a pretty brutal hike in and out of the Sandwich Range Wilderness. The hike began and ended at the Livermore trailhead, and from mile four through twenty the hike was filled with up and downs over bare ground, breakable ice, snow, ice flows, and ice bulges ranging from an easy to very difficult. - Knowing it was going to be a long day I got an early start at 6:45AM and easily made my way up the old Livermore Road to the Scaur Ridge Trail. The Scaur Ridge Trail is probably the easiest way up to North Tripyramid, the footing is good and the grades are easy to moderate. 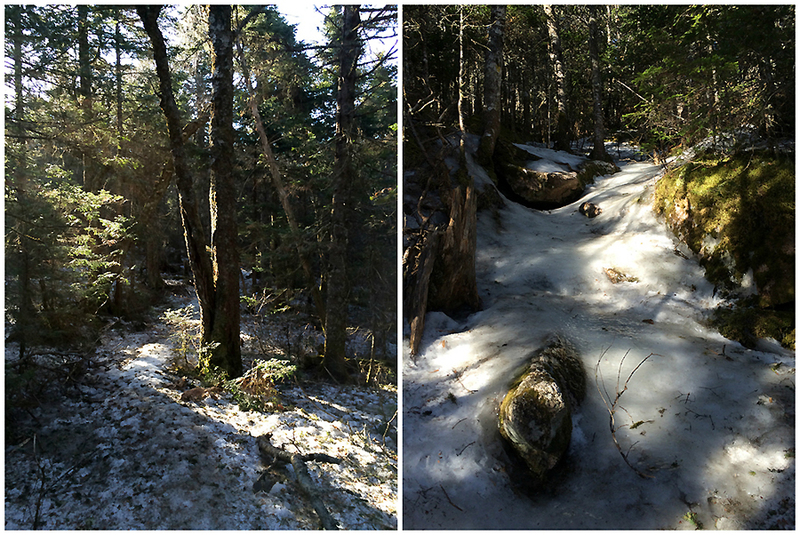 The ice started around 3,000 feet but was easy to walk up with my microspikes. 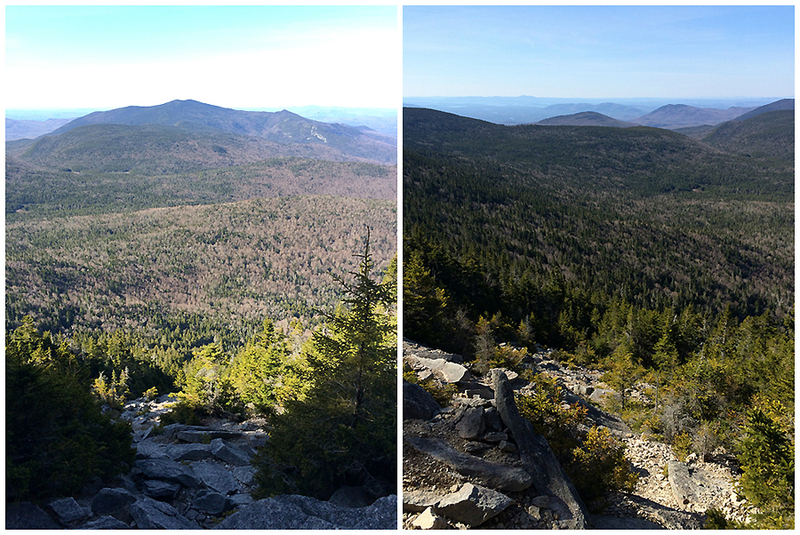 - Once gaining the ridge I hooked a right onto the Pine Bend Brook Trail where things got really interesting, especially over the last quarter mile below the summit. The trail became steeper and filled with 'bullet proof' ice, it was impossible to get any bite in the ice with my spikes so I headed into the woods and monkey climb paralleling the trail. Since it was very early in the morning and still cold out the ice had yet to soften up, so I spent most of the last 0.2 miles in the woods off trail hugging trees and carefully making my way up to the summit. - From North Tripyramid I headed over Middle and South. There was another small section just below Middle where I had to veer off trail but compared to North it was easy, and heading up and down South was a cakewalk. - Below South Tripyramid I hooked onto the Kate Sleeper Trail from the top of the south slide. 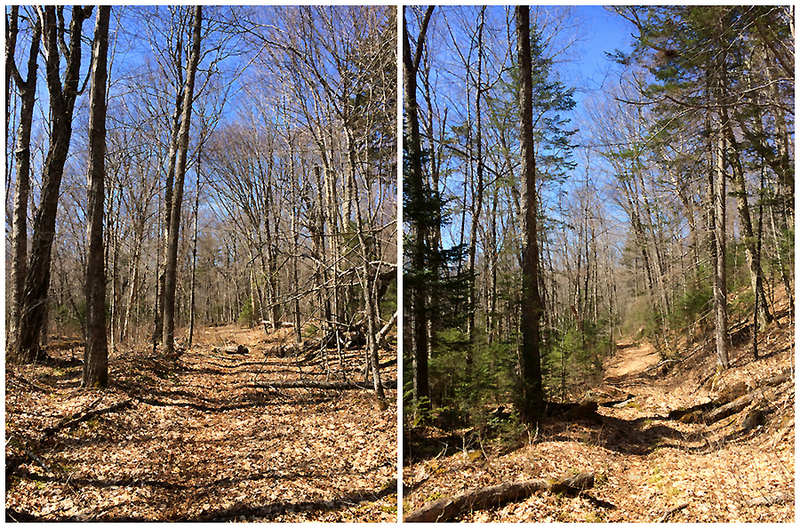 The Kate Sleeper Trail has a very secluded feel to it even though two trails where it begins and ends at, Mount Tripyramid and the Rollins Trail are heavily used, this trail sees very little use and is often overlooked. 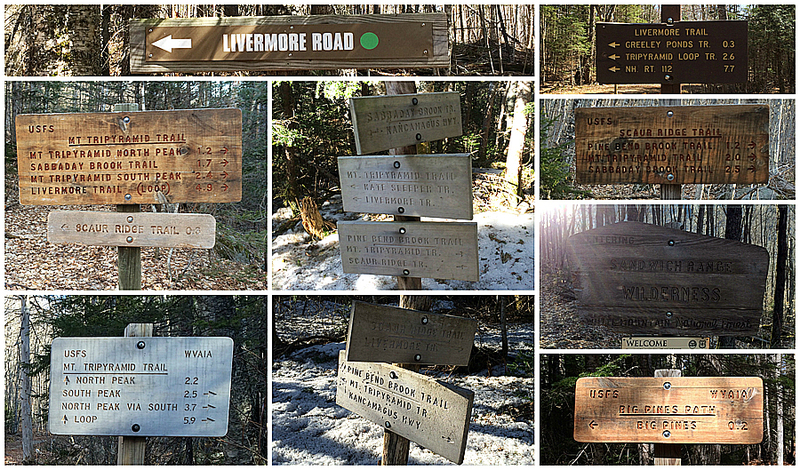 It's too bad it is because it is one of the most beautiful stretches of trail in the White Mountains. While there are no views, the pathway is very scenic and beautiful with abundant moose activity, lots of poo on the trails! I got lucky on this day as I almost walked right into a mommy moose and her calf. I came around a corner and startled them and then they startled me, they both went scurrying off into the open woods. - The trail was easy for travel through the Sleeper Ridge, it was a mix of soft ice and corn snow, these great conditions changed as soon as I stepped onto the Rollins Trail. There was more ice to deal with again, and three or four times I had to venture off trail a couple of feet and use trees to descend, however it was getting warmer by the minute so my spikes were biting in better and better. 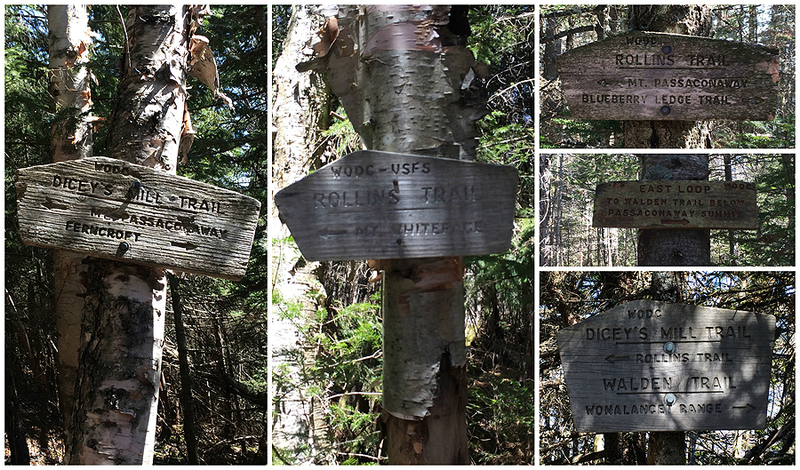 - After a few miles I reached the junction with the Dicey's Mill Trail and made the relentless climb up to the summit cone of Mount Passaconaway. I really lucked out here as conditions have improved drastically over the past week and I was able to easily make my way through the steeps without having to leave trail while ascending and descending as there were enough rocks above the ice and tree branches on the side of the trail to help me out. 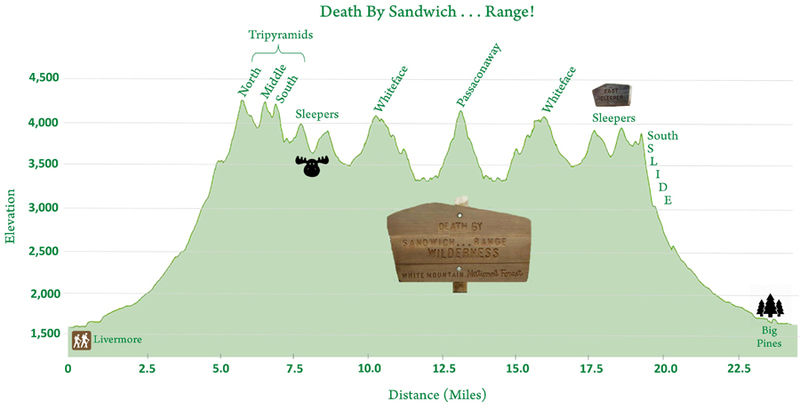 - All the summits for this hike are wooded, but Passaconaway, North and Middle Tripyramid have nice outlooks near the true summit. At the outlook for Passaconaway I ran into a hiker and his little dog Otis who looked to be having a ball. During this icy April the little dogs have had a definite advantage over the bigger ones, they can maneuver up and down the ice or off in the woods easier than the big dogs where it can become dangerous for them. 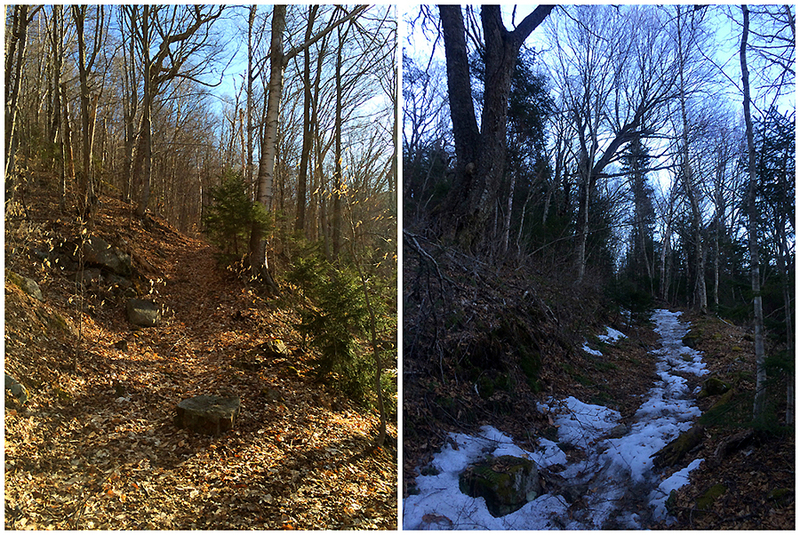 - Now it was time to backtrack over the Rollins and Kate Sleeper Trail. 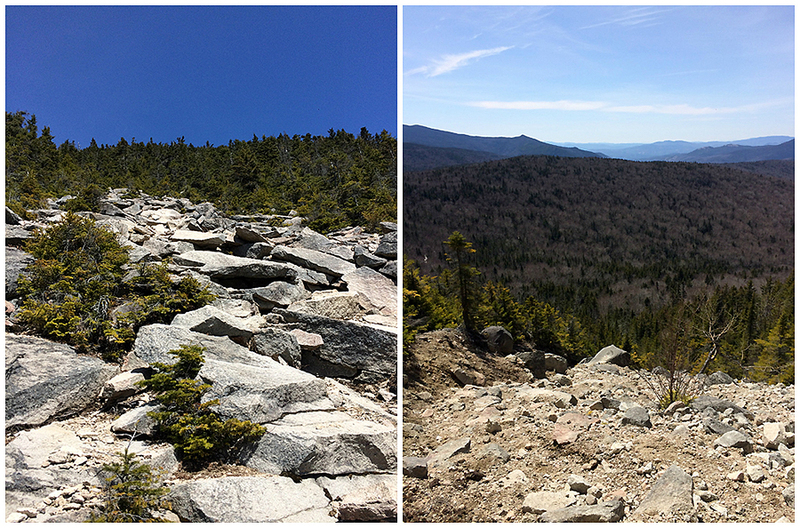 I felt really strong heading back over Whiteface and down the Kate Sleeper Trail to the Whiteface / East Sleeper Col, and then all of a sudden I started to get that bonking feeling. Stupid me, I forgot to bring an electrolyte drink, and delayer so I started to overheat and become sluggish. I haven't felt this bad on trail since my 2014 H2H run. I made sure to slow down and carefully make my way through the Sleepers until I popped back out on the South Tripyramid Slide where the rest of the hike was all down hill. Once reaching the slide I immediately felt better again. - The slide was in summer conditions, no snow or ice, making this probably the best way to do the Tripyramids right now as an out and back to avoid the ice on the northside of North Tripyramid. - Once below the slide I enjoyed the last few cushiony miles over the lower end of the Mount Tripyrmid Trail before leaving the Sandwich Wilderness and back onto the Livermore Trail. 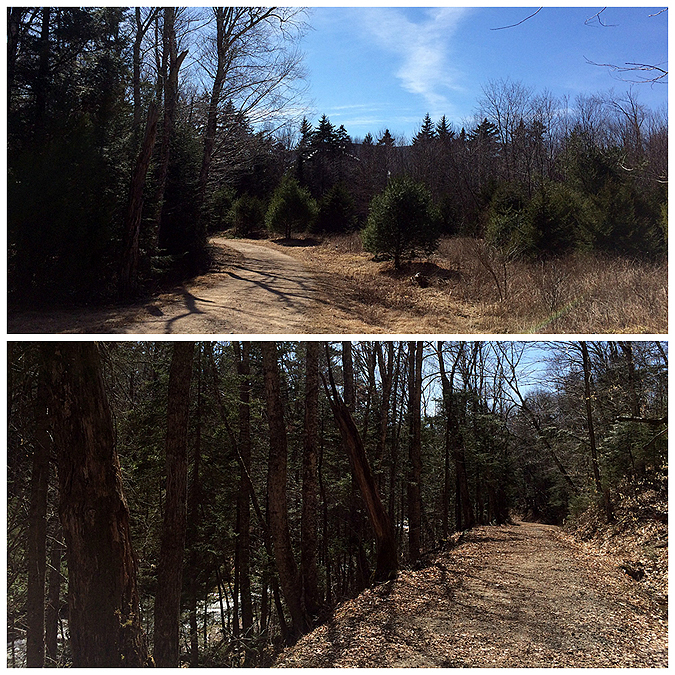 - On my way out I made a side trip on the Big Pines Trail which lead me to three huge White Pines. These pine trees dwarf all other pines and and are quite the site to see. There are not many left as they where harvested in the mid 1700's by King George who used the trees to build his ships for his navy fleet. The White Pines where marked with the King's Broad Arrow (click here for more info). I wonder if there are any White Pines with the mark still around in the White Mountains, it's been 250 years so if one still stands the bark from the tree would probably have overtaken the King's Broad Arrow marking. 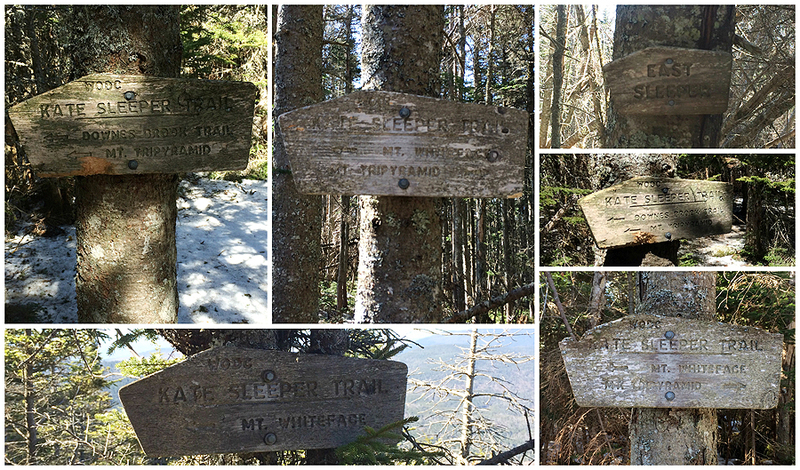 The Scaur Ridge Trail. Dry in the sun, icy in the shade! 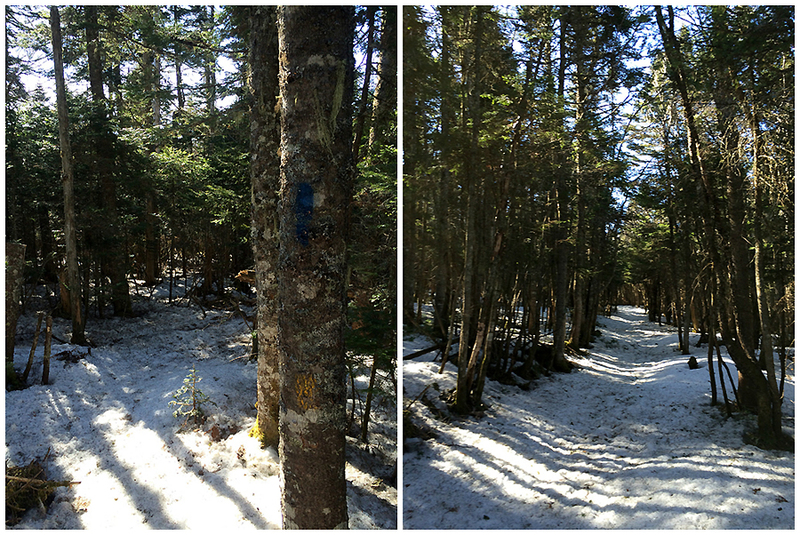 Hiking along the icy trail. This was one of the easier spots! West Sleeper Summit, with a tiny cairn...of moose poop! 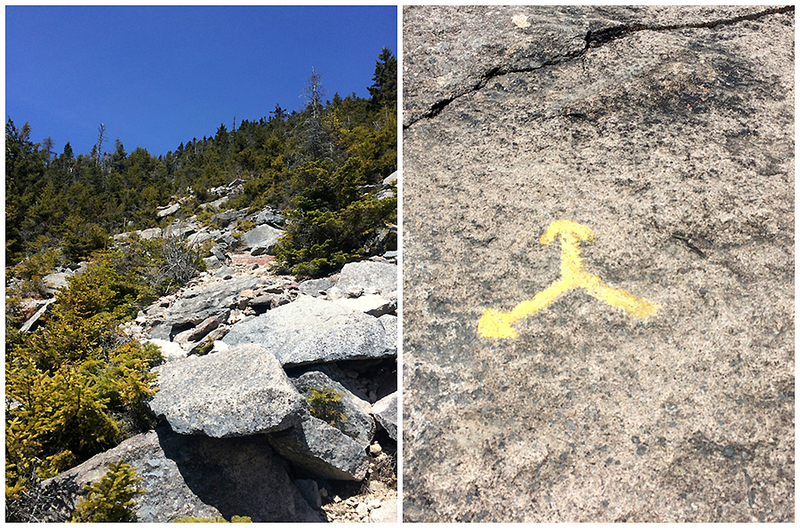 Hiking along the Kate Sleeper Trail, spotted a tree with an old yellow blaze. There are a few spots along here with faded old yellow blazes. I wonder when and why it changed over to blue? 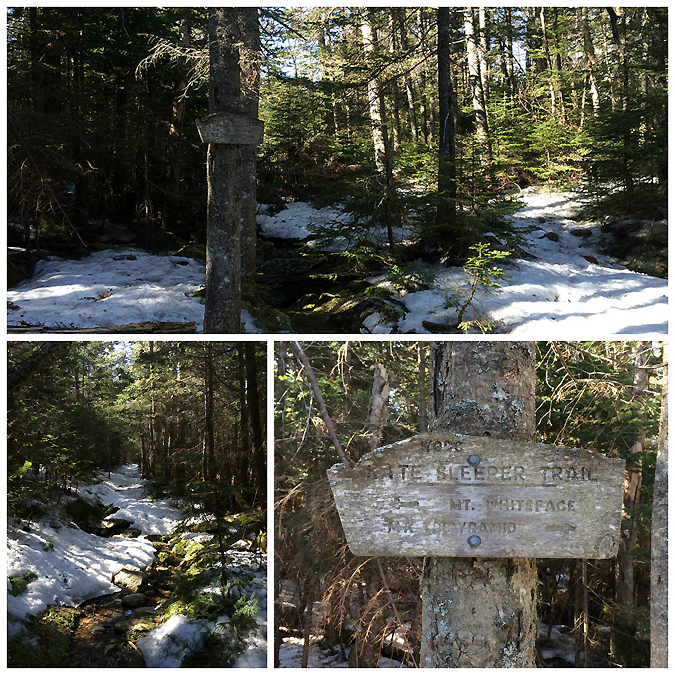 The Kate Sleeper / Downs Brook Trail junction. I always enjoy this spot, there are a couple of old yellow blazes near it and a little open marsh area near here just off trail. 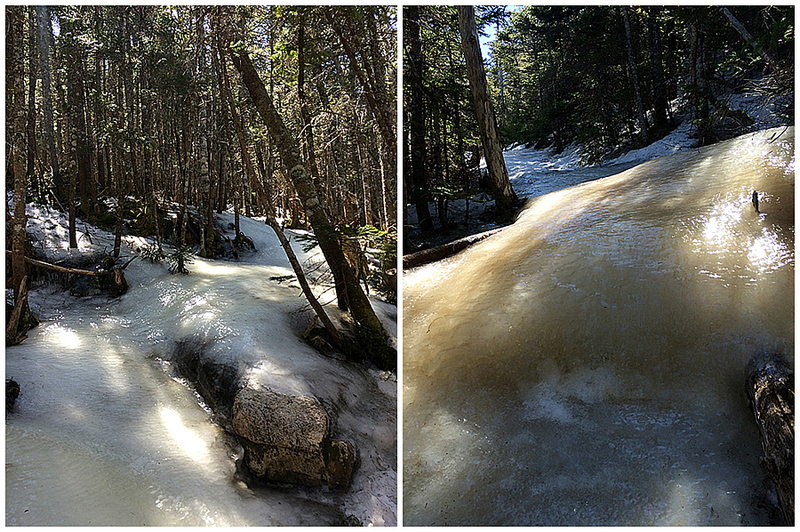 One last ice bulge on the Rollins Trail to get back over! Which way should I got?? Nice and easy, now this is the way to end a hike! Those are some big pines! Damn man we were up there the same day going from Tripyramids to Whiteface. You must have beat us to the South Slide and been back down before we got up there at around 4ish. We had a tough time on Sabbaday Brook. Love your blog! One of the reasons for my route was to avoid the Sabbaday Brook Trail. I've been on it when it's dry and I don't even like that wicked steep stretch up top, I can't image what you guys had to go through!! Glad yout like the blog, thanks! !